Isn't this just the prettiest shop? I would love to travel to New Zealand one day, and visiting The Yellow Brick Road in Auckland will be high on my to-do list when I am there. 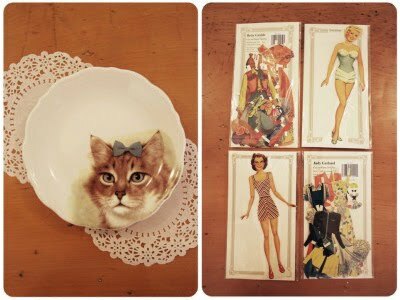 I simply must own that cat plate.. and those vintage paper dolls are to die for! You can also shop online and keep up to date with new products via their blog. oh its just super gorgeous! What a find! I know where I will head to on my next trip!